Pinoy company now manufactures knee implants designed for Asians - Orthopaedic International, Inc.
Orthopedic International (OII), led by founder and chairman Dr. Ramon Gustilo (center) and president Mr. Jude Sasing (left), showcased Filipino innovation during the American Academy of Orthopedic Surgeons’ annual meeting held March this year in Orlando, Florida. Also in photo is Christopher Gustilo, Dr. Gustilo’s son and OII marketing consultant. 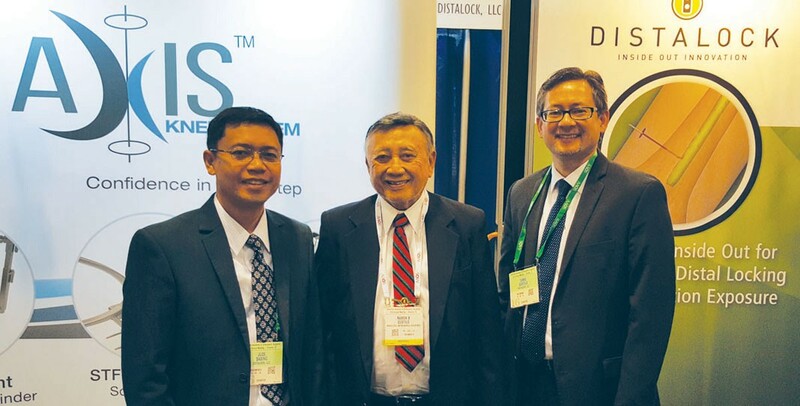 Competing in a global marketplace is daunting especially in the billion-dollar medical devices industry, but Filipino-owned Orthopedic International (OII) is confident about its prospects given rich intellectual property that has emerged with knee implants designed for Asians. This is a breakthrough because Asian osteoarthritis patients have long grappled with Western solutions that just don’t seem to fit, making it difficult for them to move about despite costly knee surgery. “Total knee replacement has been around for more than 40 years. Most aspects of implant design have been studied (so) well that there are many implants in the market that are well-designed. However, the process of bone cutting and implant alignment is still largely an ‘art’. Implant alignment and positioning are very important for long-term clinical success. A well-positioned implant can last for more than 20 years, but a misaligned implant may need to be revised after just three years,” Jude Sasing, president of OII, told FilAm Star in an email interview. Sasing was an instructor at the University of the Philippines’ mechanical engineering department when he met Dr. Ramon Gustilo, founder and chairman of OII, more than 20 years ago. A renowned inventor, professor and orthopedic surgeon practicing in Minnesota since the 1960s, Gustilo was looking for a young engineer to head the research and development (R&D) team of what was then a fledgling manufacturing company. After obtaining his master’s degree in biomedical engineering from the University of Minnesota, Sasing established OII’s R&D department in the Philippines. Composed of surgeons and engineers, the company’s R&D team has been quite prolific in developing solutions for unmet market needs around trauma, spine and joint replacement systems. OII’s Axis Knee System, for instance, addresses the two main causes of total knee replacement failure: incorrect implant alignment and incorrect femoral component rotation. It took about three years to develop, and is the outcome of the first public-private partnership on biomedical research in the Philippines. The Department of Science and Technology’s Philippine Council for Health Research and Development partially funded the development. A multidisciplinary and multicultural team of six Filipino engineers, four Filipino orthopedic surgeons including Dr. Gustilo, along with a Chinese and a Japanese orthopedic surgeon and two American engineers, designed the Axis Knee System. They reviewed more than 100 published journal articles on Asian knees and more than 800 data points to come up with the best fit. The system showcases Filipino ingenuity in the instrumentation and surgical technique, which are patent-pending. It also has sizes fitted to Caucasian knees. Computerized navigation systems, commonly used for knee replacement surgeries in the United States and other developed countries, are expensive and said to be cumbersome to use in surgery, Sasing explained. Meanwhile, lower-cost options manufactured in Asia have been found wanting in terms of material and workmanship. “The main objective was to develop an affordable total knee replacement system that meets international standards for product quality. We were also looking at instrumentation and how to make the procedure easier and more consistent for the surgeon,” he added. Launched last year, the Axis Knee System is now available at various tertiary hospitals in the Philippines including Asian Hospital, Makati Medical Center and the Philippine Orthopedic Center in Metro Manila, Chong Hua Hospital in Cebu and Riverside Medical Center in Bacolod, among others. As of June, more than 70 knee implants have been performed using the system, with surgeons reporting faster recovery and minimized pain among their patients. OII has trained more than 60 surgeons throughout the country in using the Axis Knee System, of whom about 20 have gained actual experience. “The number of cases we have done so far is still quite small. We estimate that there are around 70,000 patients in the Philippines needing knee replacement annually. However, probably only around 2,000 are done each year. Aside from the cost, part of this discrepancy is due to the lack of information about total knee replacement and that it is now available in the Philippines at a lower cost with the Axis Knee,” Sasing said. OII is pursuing product registration for the system in Thailand and Indonesia, where it is also exploring distribution partnerships. The company aims to increase its production capacity within the next five years in line with this market expansion.